Wednesday Workout: What’s the Prescription for “Flooding” Legs? Now retired from competition, Dakota Blackhorse-von Jess (bib 1) skates away as he earned his second national title at the 2015 U.S. Cross Country Championships 1.5 k freestyle sprint in Houghton, Mich. You don’t need to look too closely to see Blackhorse-von Jess is a skier with flood-proof quads in the sprints. 2014 is when a relatively green Patrick O’Brien took charge of the Stratton Mountain School’s elite team, otherwise known as SMS T2. In a relatively short time, by way of juggling athletes, wax-teching, training plan writing, and life-living O’Brien has become a problem-solving resource. 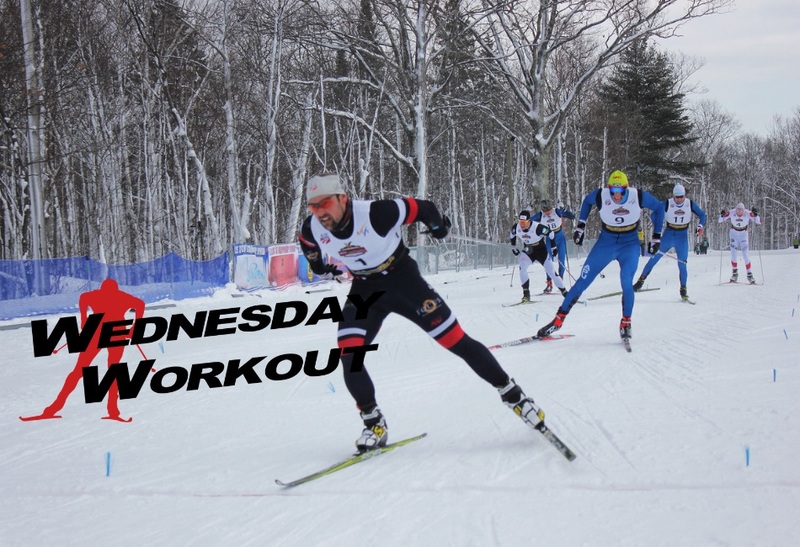 Jack of many trades, and very much an emerging master of elite level coaching, FasterSkier tossed a general question out to O’Brien for our Wednesday Workout series: what are some workouts for an athlete experiencing “flooding” in their legs when laying down big efforts? So if I understand the question correctly, the goal here is to do some workouts that will help an athlete keep from “flooding out” during a skate race, correct? Not sure if we are talking distance or sprint so I will answer both to the best of my ability. I think we are all aware of what the sensation of “flooding” feels like. The workload is high, we are pushing along fine in a race until finally we feel toxic and the motions break down, velocity drops and we either have to slow down or worse still, totally lock up. This has probably happened to just about everyone at some point in their racing career. At the surface, the issue and solution are relatively simple. Blood lactate is rising and being produced from anaerobic energy pathways faster than it can be cleared and turned back into fuel by the body and working muscles. Skiing is by nature a power endurance based sport. 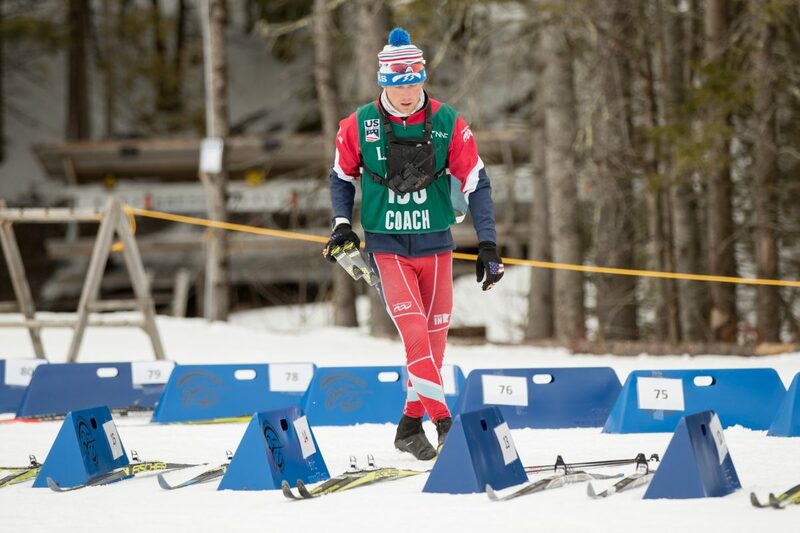 We rely upon both aerobic and anaerobic energy pathways to fuel the motions in a ski race. Depending on the race distance, course profile, elevation, athlete physiology, that balance is always shifting. The longer the duration of work and race distance, the more we rely on aerobic energy pathways, the shorter the duration of exercise and more intense, the more we are relying on anaerobic energy pathways. Everyone naturally has different physiologies. Different size “motors” (call it V02 Max, but basically how big of an engine they have). Different ratios of fast twitch to slow twitch muscle fibers (are they a natural sprinter or more inclined to distance), different size frames and builds. Additionally, everyone has different technical skills and proficiency in skiing that are tied in with all of this. Our goal in training is to raise all of these capacities up, and ideally do so in a balanced fashion. You need a big aerobic base to support an anaerobic system and power and the ability to apply force correctly to maximize velocity and do it efficiently. Now let’s circle the wagon back around to the original problematic scenario: someone struggling with sensations of “flooding out” in racing. It could be caused by an imbalance in any of these capacities, or. simply because of an athlete’s natural physiology. Someone with a naturally strong anaerobic system, good strength, and technique solid enough to produce this power is going to “flood” more easily than someone who is more aerobic and cannot produce the same amount of power. For someone like this they still need to train and refine their strengths (they sound like they could be a good sprint racer!) but they also probably need to train their weakness. They need to build enough of an aerobic base so the body can support these other energy systemsEasiersy aerobic training and well-paced L-3 threshold training during the preparation and competition season will help them make their hard training harder and more repeatable. We do a fair amount of threshold intervals because it allows athletes to rely almost exclusively on aerobic energy pathways while still ingraining good technical motions and allowing them to become more efficient at this speed. You can structure threshold intervals many different ways but for those without access to either a Heart Rate or blood lactate monitor, I tend to find longer intervals allow athletes you to find your natural “threshold”. It should be medium-hard, breathing well but not building an O2 debt or hanging on your poles at the finish. 4-5 x 10 minutes on time with 3 minutes recovery is a good starting place. You should be controlled enough during the interval that you should feel ready to begin again before the end of the recovery period. You should get tired and fatigued from the duration of the work, not the absolute intensity of it. Now, the flip side to this could be an athlete that has a very well developed aerobic system but lacks either the anaerobic system to tolerate and clear lactate, lacks the muscular endurance for sustaining a full race effort, or has a technical weakness that is magnified during these race efforts. Basically, they start a race, and at some point, they can not maintain the workload and velocity to continue at this pace — they have to slow down. For an athlete like this, doing some anaerobic power work is a great place to improve their racing. Here’s a classic: 30-30 intervals. We format them a number of different ways but the idea is as follows: 30 seconds of skiing at or above race velocity followed by 30 seconds of easy recover skiing. Vary your “on time” depending on fitness and energy level and repeat as long as the motions and workload allow. We typically start conservatively, doing 2-3 sets of 8-10 minutes of on time. As athletes build fitness and capacity they can either increase the ground speed and intensity of the on time or increase the duration of the interval. This workout is so effective because it trains a number of different systems. It taxes the neuromuscular system by challenging them to ski a pace close to, or faster than race pace. In this way, they become more technically proficient and comfortable moving fast. It recruits anaerobic pathways by demanding high power output and subsequently the production of lactate while also allowing them to tolerate and clear this lactate while building in recovery time to keep the overall cost of the session manageable. Workouts like these should help athletes feel like they can repeatedly “redline” their tachometer while not blowing their car engine. So my long convoluted answer is that it is difficult to prescribe one workout or even a progression of workouts to fix an athlete who tends to “flood” during races because there are so many possible causes. They should evaluate their strengths and weaknesses as an athlete and racer and see if there is an imbalance and try to execute workouts that will help with this. You need to train your weaknesses as much as your strengths. If they can go really fast but tend to blow up, my recommendation would be to try to prop up the aerobic system by adding some sustainability to their racing. Start your workouts nice and controlled so that carries over to your racing. More easy distance and threshold intervals will help with this. If an athlete feels like they have good fitness but they go over the line once in a race and blow up or lock up, doing more anaerobic power work could be a good solution to making those big digs in a race environment more sustainable and repeatable. You need to be able to recruit the anaerobic system, build lactate, tolerate it, and on the recovery sections of the course clear it quickly so you can repeat again on the next working section. Incorporating some 30-30 intensity sessions could be a good starting place. So many variables — this is what makes the sport an evolving puzzle!